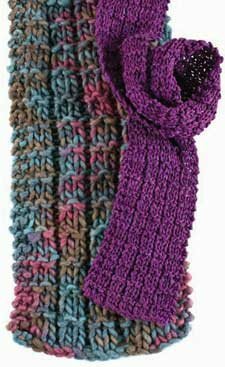 The Universal Scarf by Vicki Square. See the FREE pattern below! Sometimes you read a little something that really sticks with you. I read an essay by Vicki Square in the spring 2010 issue of Interweave Knits, about Vicki’s introduction to natural fibers. I think about that article all the time; since it’s stuck with me all these months, I thought I’d share it with you so you could store it in your brain, too! When I was in elementary school, I lived a few blocks from a lovely dress shop that I would visit with my mother. In the hushed ambiance of this thickly carpeted little shop, I found a peaceful slice of heaven. The elegant shop owner must have been a knitter of some accomplishment, because stacked against the back wall on a counter the width of the room were boxes of yarn. The clear cellophane windows on the end of each box let me see the yarn inside that I desperately wanted to touch. This woman must have recognized a budding kindred spirit in me, and I did in fact get to push my clean little hands into the wool, mohair, angora, and cashmere. My initial experiences as a knitter were strong and positive, having begun on a foundation of working with natural fibers. I suspect that is a significant reason for my continued obsession today. I’ve never met a natural fiber I didn’t like. Wool is king in the manipulation category. Knit it, felt it, mold it into anything your imagination conjures. The types of sheep, the quality of wool fleece, the spin, the weight, the rich colors, all contrive to offer endless opportunities in creativity. Line’s longevity appeals to my historical self, while the fluid drape and natural luster of this bast fiber appeals to my artistic side. Silk has been mastered for thousands of years on the Asian continent in production, processing, and in artistic presentation, from the tactile texture of raw silk to the luminescent surface of finely woven brocades. Volumes are written about the origin and the uses of natural fibers. A knitter's reality condenses it all into how it feels in her hands. Exquisite fibers translate into stunning results. That's really the bottom line. Try my "scientific" experiment. My scarf design (below) is the constant, and your choices of natural fibers to work with are the variables. Choose alpaca, choose silk, choose bamboo—I used a bulky wool and size 15 needles for one sample, and a much finer silk ribbon for the second. Follow the scarf instructions as printed, with no changes in stitch count, and you will net scarves of varying widths and lengths appropriate to different uses. Use one or two skeins for each scarf, and the needle size recommended on the label. There is no right or wrong, just a delightful experience with each yarn. Natural fibers feel good in your hands, naturally! FREE Universal Scarf knitting pattern that you have to knit. With yarn and needles of your choosing, CO 18 sts. Note: Edge sts are worked in garter st throughout. Rows 1 and 3: K2, [k2, p1] 4 times, k4. Row 2: K2, p2 [k1, p2] 4 times,k2. Rep Rows 1-4 until scarf measures desired length, leaving enough yarn to BO and ending with a Row 2. BO all sts loosely in patt. This stitch pattern is non-curling, so blocking is unnecessary. However, you may wish to spritz with water, or lightly steam, to set stitches and ends. I hope you'll try Vicki's experiment. I tried it last year, with about 300 yards of a light worsted 100% alpaca, and I loved the result. I used size 7 needles and my scarf was about 4 inches wide. I gave it to my brother for his birthday and he loved it! That's part of the "universality" of this pattern: it works for men, women, kids, and any yarn you want to use! For more interesting and exciting articles, patterns, and how to knit ideas, get yourself the 2010 Interweave Knits CD Collection set today!